In this experiment we use two glasses of different coloured liquids and watch the liquids switch places in the glasses. But how? 2 small glasses - it is important that they are both the same shape and size. Oil - vegetable oil, sunflower oil, olive oil or anything else similar. Fill one glass to the rim with oil. 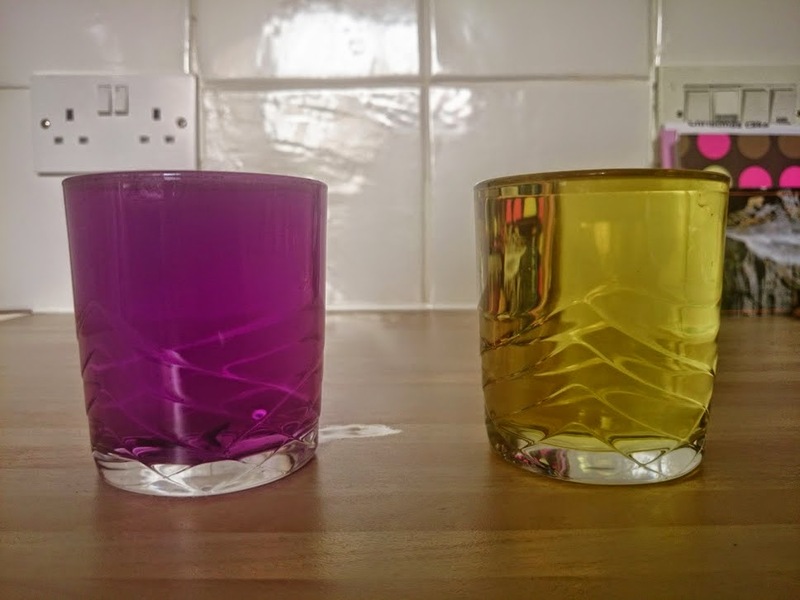 Choose the food colouring of your choice and squirt a bit in the glass that is still empty. Add some water to the food colouring and stir and then fill the glass with coloured water right up to the rim. Then, very carefully, turn the glass of coloured water upside down making sure the card is pressed firmly against the rim of the glass so not to make a mess! Carefully slide the card so there is a small gap between where the two liquids can touch but ensuring that the rims of the two glasses remain in line at all times (else you will have a MESS on your hands). The liquids swap places! How does this happen? Well do you remember my post: The Magic Upside-down Glass of water? 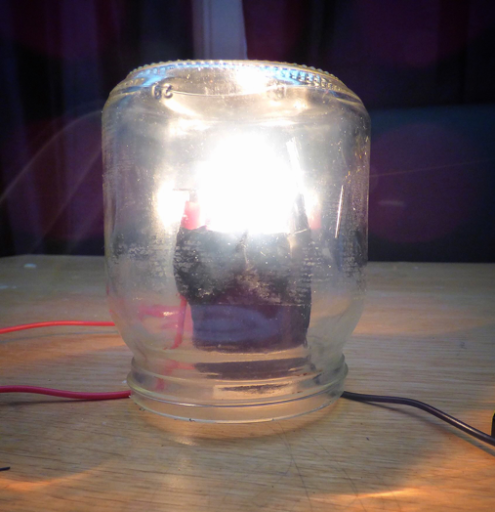 Well, the science behind that experiment helps make this one work as it makes it possible to turn the top glass upside down and put it on top of the glass of oil without any of it spilling! The Adhesion to the card happens because the water molecules have these positive and negative ends that I have mentioned. These are not just attracted to each other, they are also attracted to other materials. In this experiment the water molecules are attracted to the paper, adhering to it, while continuing to keep the surface tension with the other water molecules. This also helps to keep the card in place. 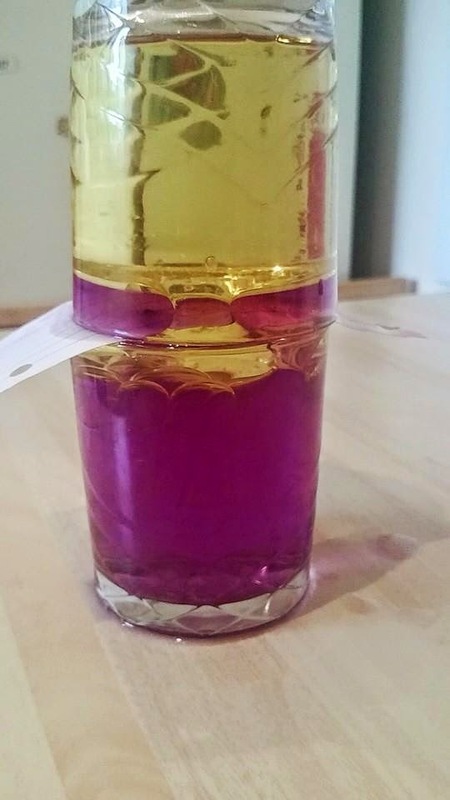 Also this experiment works due to the different densities of the liquids like in An Ordinary Life's Science post: Layers of Liquid. The oil is less dense than the water so when the gap with the piece of card is made, the denser liquid (the heavier per CM squared liquid) is pulled down and the oil floats up. 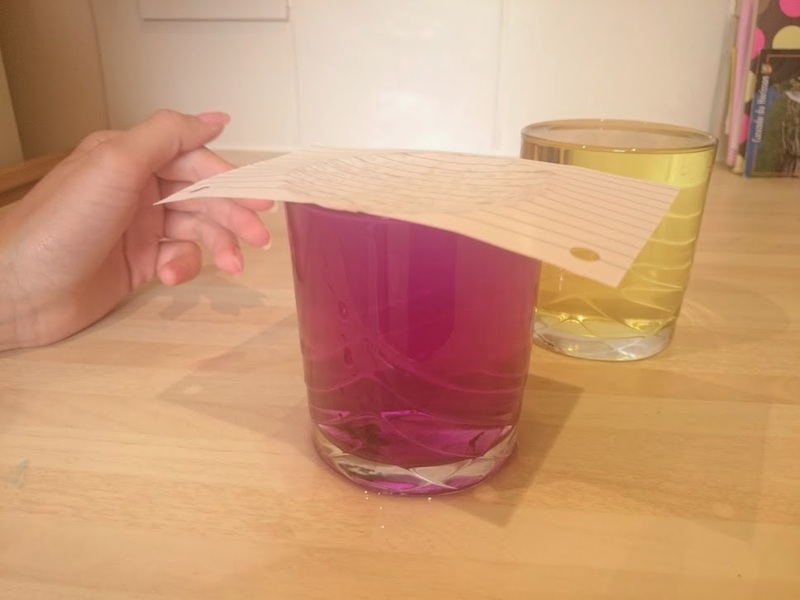 This experiment can be done with other liquids, the only thing you need to be sure of is that one is more dense that the other and that the denser liquid is in the glass you put on top of the glass filled with the other liquid. Water and whiskey work well as do water and wine (red wine so the colour difference is more apparent. If is great as a dinner party trick or just for FUN!